MyPCBackup is a desktop application that enables the users to store their data on the Internet. The application arrives at the computer bundled with various browser add-ons and adware program and offers the user online storage. MyPCBackup places its shortcut on the desktop and displays a pop-up notification encouraging the user to buy more space for the storage. 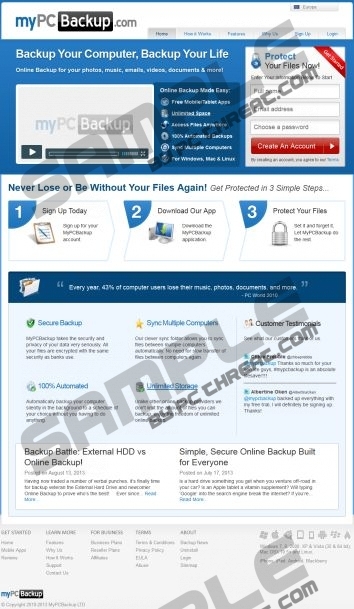 MyPCBackup enables the users to backup their photos, music, emails, videos, documents and other files. The application takes the copies of your files automatically, encrypts them, and sent to the Cloud, from which the information can be retrieved any time and from any device. MyPCBackup is known to be bundled with Linkury SmartBar and Lyrics Fan, both of which are browser applications that can change the setting of the browsers. It can also be regarded as a potentially unwanted program; however, it does pose any danger to your privacy or system performance. If you have installed the application accidentally, you can simply uninstall it using the Control Panel and its sections “Uninstall a program”. Quick & tested solution for MyPCBackup removal. MyPC Backup.....however, it does pose any danger to your privacy or system performance. Is this a pro or a con? Does this or does it NOT pose a danger? It doesn't pose a danger but it's considered a PUP--meaning software that snuck in with another install. Most people don't want it. It har***** you rather aggressively until you pay for it, too. Anyway, it's safe to get rid of.